MOBILedit! 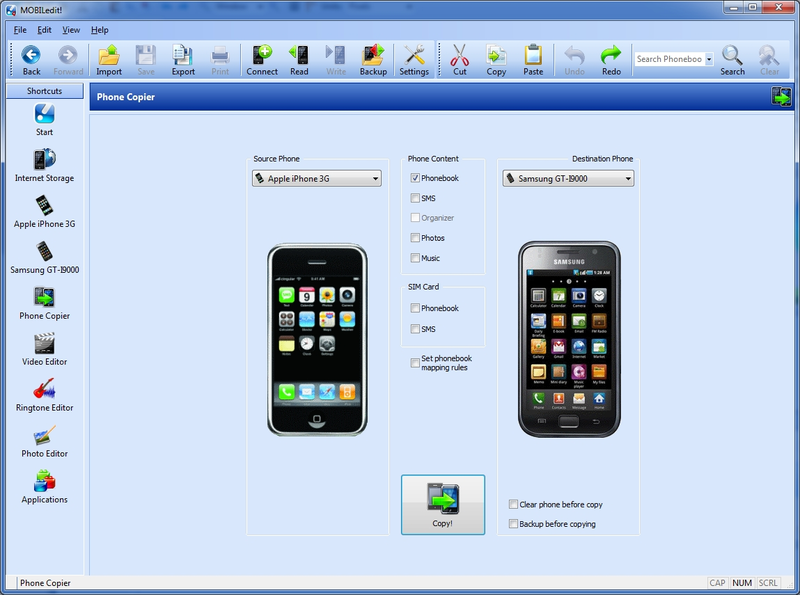 is an all-in-one mobile phone management software package offering you much more than phone manufacturers software. In addition to basic functions such as sending SMS and organizing & synchronizing the phone book, MOBILedit! offers a powerful Ringtone Editor, YouTube Video Downloader, patented mBoox Composer, Phone2Phone Copier, Photo Editor, File Manager and much more. You can also rip CDs, edit & convert your music to MP3 or other popular formats. This ultimate phone manager can download, convert & copy online videos right to mobile devices (cell phones, PSP, PDA, iPhone, iPod). You are also able to make MP3 from YouTube video in Ringtone Editor. Just connect your Motorola, Nokia, Sony Ericsson, Samsung or LG via Bluetooth, IrDA or cable and you can easily handle incoming calls and SMS in real-time or install Java games. The auto-backup feature will keep you confident in the unfortunate event of a lost phone. Increase your business productivity and personal entertainment with MOBILedit. iPhone supported.